I've started reading Henri Nouwen's book The Inner Voice of Love - A Journey Through Anguish to Freedom. Henri's writings have always moved me. He shows a raw vulnerability through which the Holy Spirit gently and soothingly speaks. I remember in late summer, 1996, Father H. and I were planning to invite Fr. Nouwen to speak at the following year's Courage Conference. Then, before we'd had a chance to compose an invitation letter, we heard that Henri Nouwen had suddenly died of a heart attack. It was September of that same year. Fr. 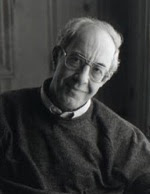 Nouwen was only 64. It is not easy to stay with your loneliness. The temptation is to nurse your pain or to escape into fantasies about people who will take it away. But when you can acknowledge your loneliness in a safe, contained place, you make your pain available for God's healing. God does not want your loneliness; God wants to touch you in a way that permanently fulfills your deepest need. It is important that you dare to stay with your pain and allow it to be there. You have to own your loneliness and trust that it will not always be there. The pain you suffer now is meant to put you in touch with the place where you most need healing, your very heart.